Locally known in Malaysia as ‘Burung Merbok’, these Zebra Doves are marvelous to look at as they go about pecking at the edge of the tarred road outside our front yard. Visiting daily and sort of routine-like, they seem oblivious of the surroundings and vehicles plying the route. 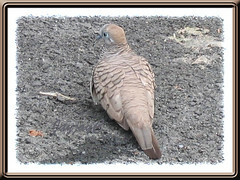 Sometimes, the Zebra Dove forages alone, and at other times seen in company of two to five. Hehe, I just had to create a flock of them as seen in this image above since I can never get a picture of them altogether however hard I’ve tried. 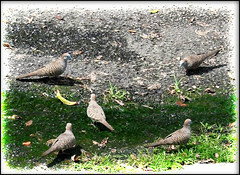 A collage of five shots actually of a single dove, ;) busily ‘gorging’ with whatever are available on the ground. Probably feeding on the short grass, weeds and rice grains washed down from my neighbour’s dog house, plus drinking from the mossy puddles created on the uneven road surface! We’re so blessed to be able to catch a view of at least one or two of these doves almost daily. 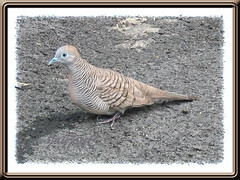 This pretty dove was seen foraging on the ground just outside our back yard fence, shielded from the prying eyes of our darling pet dog, Maxi. Hehe, just because he’s the residing king at the back yard, he’ll bark his head off at any living animal or bird that dare step foot or fly into his domain! Even cats strolling outside really agitates him into action! Geopelia striata is quite a small bird (20-23 cm long), sturdy and slender, with a long narrow tail and wedge-shaped wings that span to about 24-26 cm. 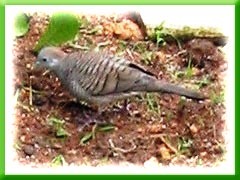 Spotting attractive features, with bluish grey cheeks, blue skin encircling the eyes and pale grey beak; crown and neck brown, the upper parts brownish-grey with small crescent-shaped brownish-black bars; the underparts are pinkish, with black and white zebra-like bands on the sides of neck, breast and belly, hence the name Zebra Dove; feet are pinkish brown and also banded. Its call is a series of soft, staccato cooing notes, with several different versions that vary according to its moods – mostly a low coo-crr-coo, a gentle crr-crr or a melodious coo-coo-crr, with emphasis on the last note. Lovely to hear! 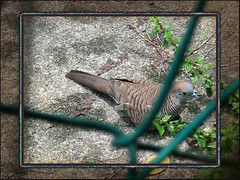 Reminds me of those wonderful years almost 3 decades ago when John, my beloved hubby used to rear a few caged birds which included the Zebra Dove, as a hobby. And the amazing thing was the pet dove always cooed the minute it heard its master had returned home from work! Incredible…without seeing, it was able to sense John’s return as he drove into the driveway! In fact, Zebra Doves are popularly kept as caged birds worldwide, especially in Thailand and Malaysia for their delightful and loud cooing. Some owners even keep and train their doves specially for cooing contests! Distribution: Native to Southern Thailand, Tenasserim and Peninsular Malaysia to the Indonesian islands of Sumatra, Java, Bali and Lombok. It can now be found in Central to Northern Thailand, Laos, Borneo, Sulawesi, Hawaii, Tahiti, New Caledonia, the Seychelles, the Chagos Archipelago, Mauritius and Saint Helena. Habitat: Dry and open habitat with scrub vegetation or wooded areas, farmland and villages, as well as cultivated urban areas including parks, gardens and outdoor food courts. Also found in mangroves. At night, the Zebra Doves roost high in trees, with preference in coconut palms. Feeding: Feed on grass and weed seeds, even eat insects and small invertebrates. They prefer to forage on bare ground and short grass, on roads, sidewalks, garden lawns and parks, even sourcing bread crumbs or food littered around dining tables. External links: Check Wikipedia and Naturia for more information. Yellow-vented Bulbuls nesting on our Lady Palm Tree! White-browed Bulbuls nesting at our garden porch again! Asian Koel (Eudynamys scolopaceus) with loud territorial call!